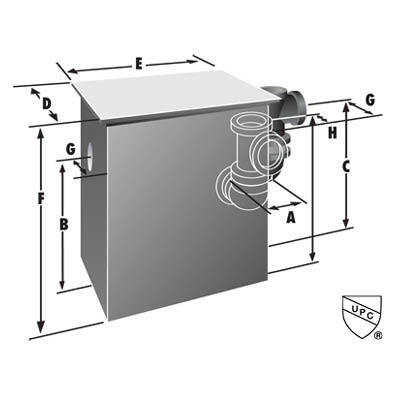 Grease separators shall be Rockford Separators as manufactured by Rockford Separators, Inc., Rockford, Illinois, and as noted on plans. Furnish ______ Rockford Model RTO-______ all-welded steel separator for on-the-floor, partially recessed, or flush-with-floor installation with ______ g.p.m. intermittent flow and ______ lbs. greasy sludge capacity, visible double-wall outside trap seal, removable filter screen, non-skid gasketed cover suitable for pedestrian traffic and secured with stainless steel bolts, two steel plugs and coated with enamel coating inside and outside. All body vents are 2.00" IPS.